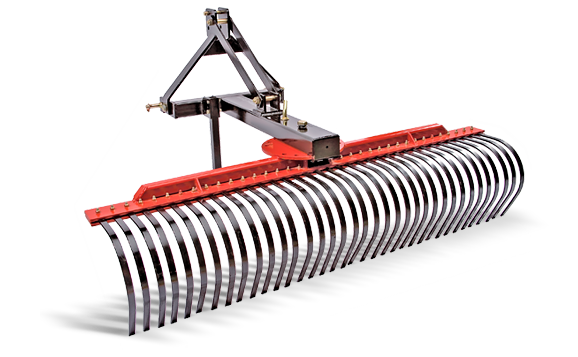 THE FARM KING LANDSCAPE RAKE IS IDEAL FOR SEEDBED PREPARATION AND TRASH REMOVAL FROM LONG GRASS, DIRT AND GRAVEL. Five-position angle adjustment allows the operator to evenly distribute crushed rock or clumped soil. 5', 6', 7' and 8' models are available with quick hitch compatibility. Tines are evenly spaced 1" apart. Used to clear off unwanted material. Ideal for spreading and leveling crushed stone and other landscaping materials and can be used to maintain beaches and recreational areas. Width 60" 72" 84" 96"